Our leathers, our finishes, colors and thicknesses are those described in the "Products" section of this site. We're committed to keeping up with the time and ensuring that our organization can meet all your needs. Even if none of our product seem to match your needs, we are committed to customizing a product and working with you. Our staff will be happy to accomodate any type of request and will develop the ideal product for your needs. In this case, the price will be increased by an amount to be agreed upon, according to the additional processing required, such as development costs, sampling and production. Our Guarantee "Genuine Veg. Italian Leather"
In order to guarantee our leathers, we have created a custom Label, in Italian and English, to ensure and certify that all of our products are Natural, Vegetable-tanned, chrome-free and, of course, Made in Italy. 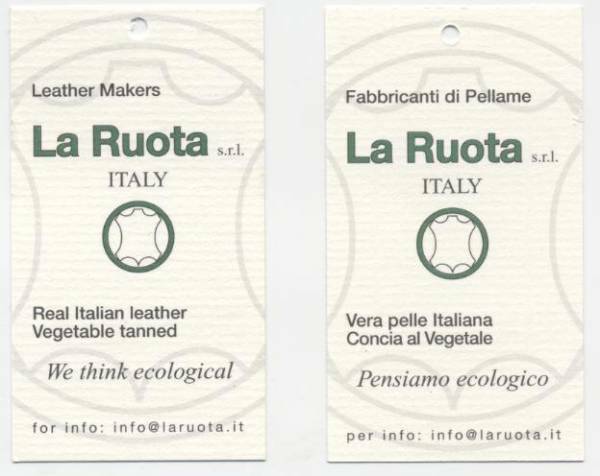 You can attach this label to all your products made with our leather, to represent a real added value: this ensures that your consumer is getting only natural and eco-friendly leather that has been produced according to the ancient Tuscan tanning tradition. You can request these additional labels which we'll be happy to send to you FREE of charge along your leather order. In the "Products" section you'll find the type of leather best suited to your needs. In the event that, before proceeding with the order, you want to get a sample (minimum size 10x10 cmx. ), simply register on our site, and order the sample of the article in the color you want, at a price of € 2.00. For any other special requests, you can contact us in the "Contact us" section, and our staff will respond as soon as possible.